MARTORELL : August 29, 2008 - Less than six months after its launch, the new Ibiza range has expanded with the arrival of two new versions that combine distinct sports character with the commitment to environmental sustainability. In the first, innovative design and technology join character and exclusivity in the Ibiza CUPRA, a vehicle whose adrenaline rush is provided by the 180 hp 1.4 TSI twin-turbo engine and the 7-speed DSG gearbox with steering wheel shift-paddles. In turn, the attractive ECOMOTIVE version is the most ecological of its segment thanks to its reduced CO2 emissions figure of only 99 g/km. Created for exciting driving pleasure, the new Ibiza CUPRA features an exclusive design with a spectacular front end where the "Arrow Design" concept lends maximum expressivity, especially due to the newly designed bumper, featuring the air intake vents surrounding the central grille, and the overall athletic looks, with its outstanding 17" alloy wheels, prominent shoulders that house the rear lights, and the newly designed, centrally placed trapezoid tailpipe. Making its debut on the new Ibiza CUPRA is a brand-new version of the powerful, efficient 1.4 TSI engine. This twin-turbo engine now delivers 180 hp and is mated to a seven speed DSG gearbox with steering wheel shift-paddles. The 1.4 TSI twin-turbo engine delivers a noteworthy reduction in emission levels and fuel consumption thanks to its small cylinder capacity, keeping in line with the brand's commitment to reducing CO2 emissions on the entire engine range. The combination of this engine and the agility and sporty character of the DSG gearbox provide the driver with a thrilling experience at the wheel. Add to this the possibility of changing gears by tapping the paddles located on the steering wheel and the great stability offered by the SEAT "Agile Chassis" system, and the driver is able to reach the highest levels of sports driving. Among its equipment, besides the standard ESP, the Spanish maker's new car also features ABS, TCS + EBA, driver and passenger airbag, head airbag, Hill Hold Control, tyre pressure loss warning light, twin chrome headlights, fog lamps with cornering function, "easy entry" system on the passenger seat, CUPRA suspension, CUPRA sports seats and aluminium pedals. Following the perfect tread marks traced by its predecessor, the new Ibiza ECOMOTIVE will be launched at the Paris Motor Show with a revamped styling and the reputation of being the most ecological car of its segment, by placing the CO2 emissions level at only 99 g/km. These figures will also allow customers to save on registration tax when buying the new Ibiza ECOMOTIVE. Available in both the 5-door and SportCoupe' versions, the Ibiza ECOMOTIVE is equipped with the 80 hp 1.4 TDI with DPF particulate filter which not only allows the engine to reduce emissions under the 100 g/km mark, but also reduces fuel consumption. Undoubtedly, the updated engine software contributes to achieving these results, as well as improvements to the gearbox and the gear ratios, the new 175/70 R14 tyres, the 14" wheels with hubcaps and, as on the previous model, the replacement of the spare wheel with an antipuncture kit. Another aspect which was closely studied to reduce fuel consumption and emissions figures was the aerodynamics of the car. The new ECOMOTIVE version of the Ibiza incorporates several solutions, such as the new closed front grille and new rear spoiler that combine to reduce resistance to movement and therefore decrease mechanical effort as well as fuel consumption and emissions. As for the interior equipment, the ECOMOTIVE has the same comfort and safety elements as on the rest of the Ibiza range, in this case with the Reference finish. Both the new Ibiza ECOMOTIVE and the CUPRA will be manufactured exclusively at the SEAT plant in Martorell near Barcelona. 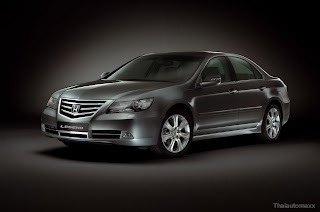 At the Moscow motor show, Honda has revealed the look of the re-styled Honda Legend to Europe. This revised model gives a new edge to the top of the range Honda and responds to customer feedback on the current model. The most noticeable change is to the exterior style of the Legend, with new lights, bonnet, front wings, boot lid, bumpers and the adoption of standard 18" wheels. Under the restyled bonnet is one of the most powerful V6 engines in this sector, giving the power of a V8 engine, while retaining the smoothness and fuel economy inherent to this layout. The new engine has an additional 200cc that helps to give the new Legend greater torque across the whole rev range. Complementing this increase in capacity the 3.7 litre V6 has VTEC added to the exhaust valves, joining the system already fitted on the inlet side. These realised a 20% increase in torque in the mid-range. The result is an enhancement to the feeling of power, as well as the improved acceleration. Coupled to this revised engine, is an all-new 5-speed gearbox that helps the driver exploit and enjoy the revised power unit. The new box has switched to a straight gate and empowers the driver with additional control over gear selection with revised steering wheel mounted paddle-shifters and new gearbox software. The new transmission reacts faster to changes in driver input even in the normal automatic mode and so gives the driver access to power when it's most needed. The combined effects of the improved transmission and increase in torque mean that the new Legend can accelerate from 0 to 100 km/h in 7.1 seconds, 0.2 seconds quicker than before. Fuel economy and CO2 have also improved over the previous model, despite the improved acceleration performance. Central to the concept of the current Legend is the cabin refinement which reduces the stress of modern motoring. This theme has been taken a stage further with the new car by equipping it with a suite of NVH reducing technologies. The most advanced of these is the Active Noise Cancellation system (ANC), which cancels out low frequency noise by playing the opposite wave form through the Bose sound system. New to the flagship is a new form of sound deadening mat that has improved noise reducing properties and is lighter than conventional materials. An acoustic windscreen and improved bushing complete these improvements to the already very refined Honda flagship. Safety is a cornerstone of the Legend, and adds Active Head Restraints to its already impressive safety equipment. The new head restraints are similar in principle to the items found in the Civic and Accord models and compliment the reassuring ACE (Advanced Compatibility Engineering) body structure. Optional in some markets are the Adaptive Cruise Control and CMBS systems, which use millimetre wave radar to detect and help reduce the risk of collisions. The chassis of the Legend has also received some attention to further enhance the Legend's rock solid, yet entertaining handling. Although the very advanced SH-AWD system remains unchanged the settings for the suspension have been altered to improve the ride and handling. The already well equipped Legend gets some more revisions to compliment the new model. Rear seat passengers can now enjoy the benefits of heated seats, while the Bose Audio system now has a USB socket, to enable the easy connection of an iPod. SEOUL, Korea - GM Daewoo Auto & Technology (GM Daewoo) has introduced the 2009 model year Winstorm. The latest version of its popular SUV, which includes additional convenience and safety features, goes on sale nationwide beginning August 25. Among the new features that come standard on all models are a roof rail, self levelizer and rear parking. Reflecting the opinion of customers, GM Daewoo also has expanded the number of standard and optional features on each of the Winstorm's trim levels. Based on the model, they may include a larger driver's sunshade, leather gear knobs, a sunroof, 18-inch alloy wheels, curtain airbags and the ISOFIX child safety seat system. Despite this feature expansion, the vehicle prices remain unchanged, making the 2009 Winstorm purchases even more attractive. In addition, the most popular trim level, the Winstorm Xtreme now comes with an optional package for the LT Deluxe and LT Supreme that accentuates the SUV's sporty, dynamic looks. It includes a red-stitched black and red leather interior, a chrome bumper grille, chrome-ringed fog lamps, rear clear chrome lamps and large dual mufflers. Rick LaBelle, GM Daewoo Vice President of Vehicle Sales, Service and Marketing, said: "The 2009 model year Winstorm maximizes customer value in the SUV segment. We expect that its introduction will boost SUV sales in the domestic market." In connection with the introduction of the 2009 model year Winstorm, GM Daewoo is launching a new advertising campaign entitled "Refreshed and Out of Routine," which features a Winstorm floating on a raft. It gets its inspiration from famous poet Eun Ko, who wrote: "Go where you are a stranger." This reflects the Winstorm spirit. The advertisement will begin airing on August 25. Since its launch in July 2006, the Winstorm has been well received in the global market. The SUV got the spotlight in Spain with the nomination as the best SUV in the '2007 Best Car of the Year' award selected by 53 auto industry experts and journalists. On top of the honorable moment, in the same year, the Winstorm recorded not only the third-biggest market share in the mid-sized SUV market in Australia, but also the segment-leader in sales in Vietnam. In June 2008, GM DAEWOO launched the Winstorm MAXX, premium compact SUV to enhance it's SUV lineup.